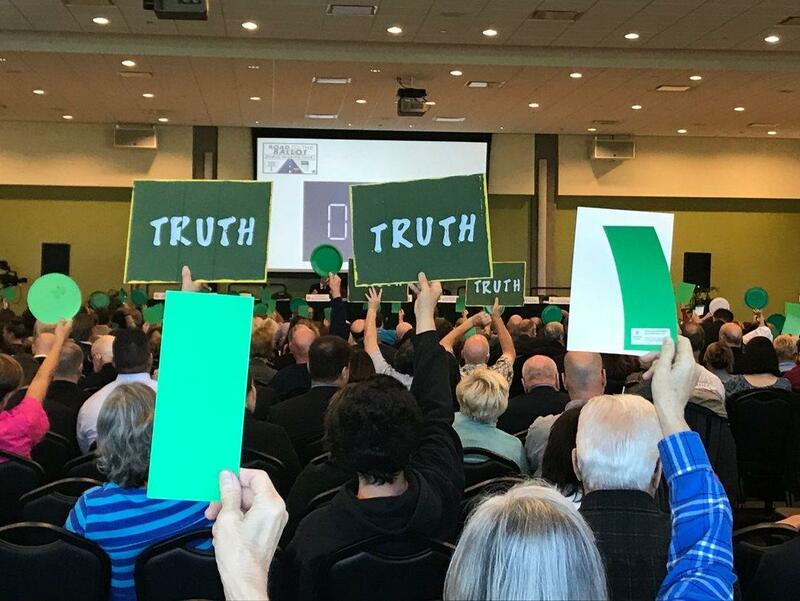 People attending Tuesday's hearing were asked to wave green signs to support an issue, red to oppose. A slew of women wearing "Handsmaid Tale" costumes attended Tuesday's Constitution Revision Commission hearing to oppose an amendment addressing reproductive rights. About two dozen parents from Parkland, where 17 people were killed last month by a gunman, traveled from South Florida to the hearing in St. Petersburg. They’re advocating for new language introduced into a proposed amendment about property rights. ‘If we can get our public, our voters to decide on what we want, in our Florida Constitution, I think we should have that voice,’ said Shelbie Seys, a mother of three children in public schools in Parkland. Since the high school shooting at Marjory Stoneman Douglas High a month ago, Seys has been among the parents lobby for gun restrictions in Tallahassee. She said this proposal goes farther than what Gov. Rick Scott signed into law last week. And if passed, it would be permanent, she said. “There could be a governor in the future that could take that back, and then we would be taking a step back in the wrong direction,” she said. “If we had taken action when the first school shooting happened in America, we would not have this problem. Nicolas Cruz would not have murdered children,” said Safiyyah Ameer, 14, and a student at Blake High School in Tampa. The amendment added Tuesday includes letting voters decide the assault-weapons ban, if gun buyers should be 21 years of age and if the waiting period to buy firearms should increase from three days to 10. 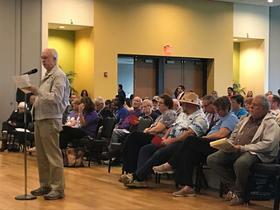 Nearly 400 people signed up to speak at the final hearing for Florida’s Constitution Revision Commission. 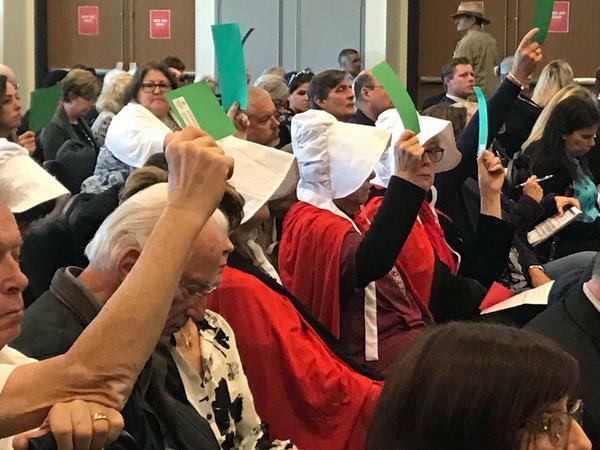 In addition to the gun issue, greyhound racing, charter schools, privacy and reproductive rights were among the more controversial amendments being considered for addition to November’s ballot. Instead of applause, attendees were asked to wave green or red signs to show support or opposition to a speaker’s topic. A proposal to ban greyhound racing drew dozens of supporters and opponents – and a handful of dogs. Carey Theil of the Greyhound Protection Group, or Grey2K, spoke in support of the ban. Theil, president of the national anti-racing group, said he realizes a ban will affect the lives of those who work in dog racing, but isn’t worried about the political battle. "Compassion and a commitment to the better angels of our nature also means rejecting cynicism, rejecting rationalizations of cruelty, rejecting false equivalencies and rejecting personal attacks," he said. Theil argued that voters are the best ones to decide this issue. Several efforts to ban dog racing in Florida have failed to pass in the state legislature. Another issue garnering attention before the hearing Tuesday was one being pushed by victim advocates. Supporters of ‘Marsy’s Law’ got an endorsement earlier in the day from Gov. Scott. 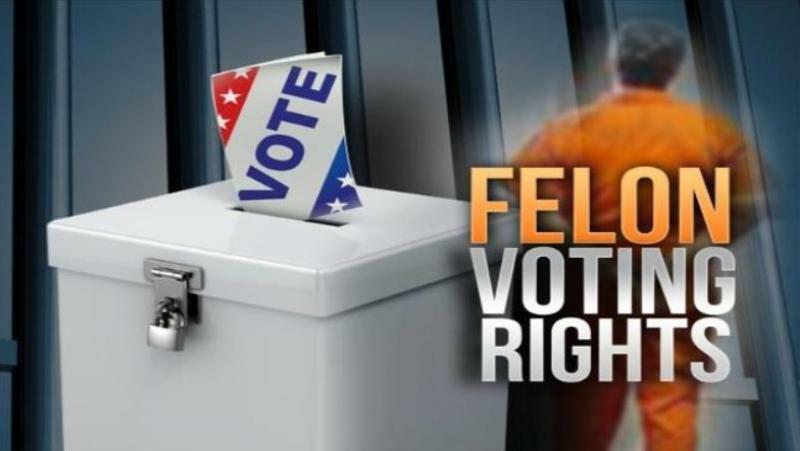 Scott and supporters say Proposal 96 creates equal rights for crime victims. At the hearing, opponents said there would be ‘unintended consequences’ if voters make Marsy’s law part of the state constitution. Several said protections already exist in state law. Commissioner and Sen. Darryl Rousson, D-St. Petersburg, said while he appreciates the works of the elected and non-elected appointees, he feels the 36 proposals lean more toward issues popular with Republicans. “I wish there were a few more philosophies outside of party that would be reflected in the proposals,” he said of the commission which convenes just once every 20 years. Backed by Gov. Rick Scott and other Republican leaders, a proposed constitutional amendment that would make it harder for the Legislature to raise taxes and fees appears to have broad voter support, a new poll shows.